A WOLFF IN DRIVER'S CLOTHING: Susie Wolff has been given an expanded role as a development driver by Williams F1. 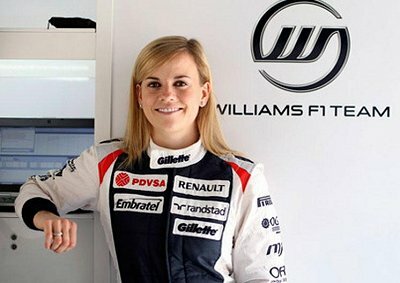 LONDON, England - Williams has handed development driver Susie Wolff an expanded role and said the wife of shareholder and former executive director Toto would be first to try out the Formula 1 team's 2013 car. The 30-year-old Scot who raced German Touring Cars for seven seasons (but scored only four points) will undergo more time in a race simulator during 2013, along with more in-car testing, Williams said. First she will be at the wheel of the new FW35 car during an aerodynamics test in Spain's before the second pre-season tests in Barcelona start on Febuary 19, 2013 and will do most of the team's aero testing. Technical director Mike Coughlan said: "Susie has proved herself to be a valuable addition to our driver roster and her feedback during simulator sessions is second to none. We will step-up her role through 2013." Wolff joined Williams in April 2012. Her Austrian husband, now executive director at F1 rival team Mercedes, said she was "showing that women can play a role at the top level of motorsport". Williams drivers for 2013 will be Venezuelan Pastor Maldonado, a race-winner in 2012, and Finnish rookie Valtteri Bottas. The team won nine Constructors' titles between 1980 and 1997 but was eighth overall in 2012. F1 cars are capable of speeds up to 375km/h, and what better way to see just how fast they really are with a side-by-side comparison against a 'normal' GT racing car at Spa-Francorchamps. Mercedes driver Lewis Hamilton dishes the dirt on what he thinks is 'really cool' in motoring.